If you ask 10 people how to start an aquaponic system you’ll get about 9 or perhaps 10 different answers, with each person insisting that their method is best. The idea is that you need to get a system ‘cycled’ which means establishing your beneficial bacteria populations within the system so that they can they can convert the ammonia wastes into nitrates so the plants can use them. Anyway, there are a number of different ways you can get your system started. It’s always good if you can ‘seed’ your system from an existing system or from someone who has an aquarium or pond. Aquarium filters will be filled with the beneficial bacteria you want growing in your aquaponics system, so will pond filters or even just the pond or aquarium water. So if you can collect some of this, it will help your system to establish even quicker. If you can’t find any, or don’t know anyone you can source some bacteria from,don’t worry, they will establish themselves naturally, it will just take a little longer. You may want to get yourself a test kit so that you can follow the cycling of your system, especially when using fishless methods requiring addition of different sources of ammonia. 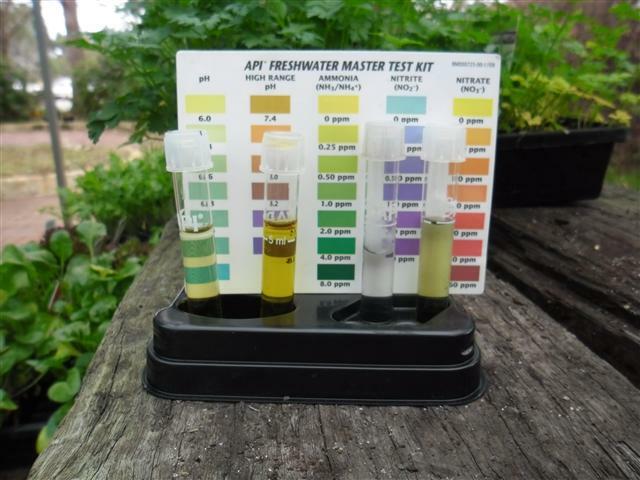 A test kit which tests pH, ammonia, nitrite and nitrate is best. Keep in mind that the most important thing is to get your system up and running, it’s a good idea to leave your system running for a minimum of a day or two before introducing fish or begining any long term plans, mainly because you need to be sure that the system is working well and there are no leaks or other potential problems. Sort out any little niggling problems you may have with the system before your fish arrive because once they are in, you don’t want to then stop your system for running repairs or changes if you can help it.